Our formidable team of Vagabonders has varied paddling backgrounds and experiences. They are passionate about paddling, the outdoors, their community and sharing their passions. Celliers Kruger heads up Vagabond’s R&D and production. He designs all of our boats, fittings and accessories and oversees production to ensure that every product manufactured is to the highest standard. James Simpson brings his business experience to the team. His rationality and attention to the business elements will see Vagabond grow over the coming years. Lisa de Speville has a varied background in media, PR and event organising. She is our connector. Lisa brings people together and shares the magic of Vagabond. 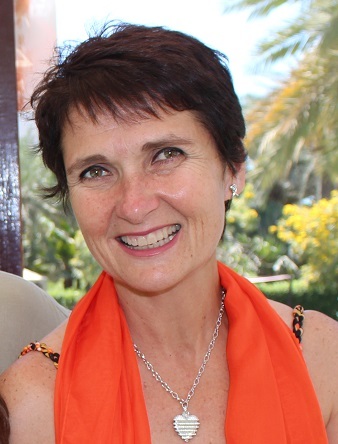 Nicola Simpson’s extensive experience with tourism, teams and companies contributes marketing oomph to our team. She and Lisa work closely together. While not involved with the day-to-day business of Vagabond, Marius du Preez’s input is varied. From prototype testing to providing an alternative view, Marius adds a balanced perspective to our company. When and how did you start paddling? I grew up near the Klip River and played on the river as a young teenager. But it was only at university, in 1991, that I got into river racing and started to take paddling seriously. 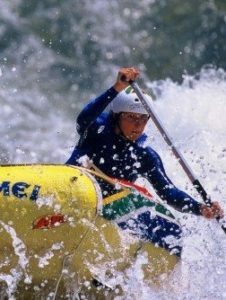 I first competed in river marathon events, like the Duzi Canoe Marathon, Fish River Canoe Marathon and The Umko (Umkomaas Canoe Marathon), and played canoe polo before getting into whitewater kayaking. This led to me touring South Africa to write ‘Run the Rivers of Southern Africa’ and to start designing and manufacturing kayaks for my first company, Fluid Kayaks. What types of boats have you paddled? 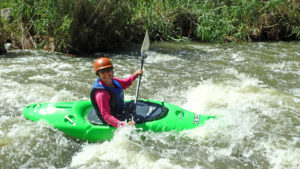 Various whitewater kayaks, K1 and K2 racing kayaks (marathon and river), open canoes, 6-man rafts (racing), oar rafts, slalom kayaks, canoe polo, downriver wildwater, and surfskis. What are your notable paddling achievements? Representing South Africa at World Championships (Freestyle Kayaking); a number of first descents. What memorable paddling experiences stand out? Two years of travelling and paddling full time in 2000-2001, when I wrote the guidebook ‘Run the Rivers of Southern Africa’. 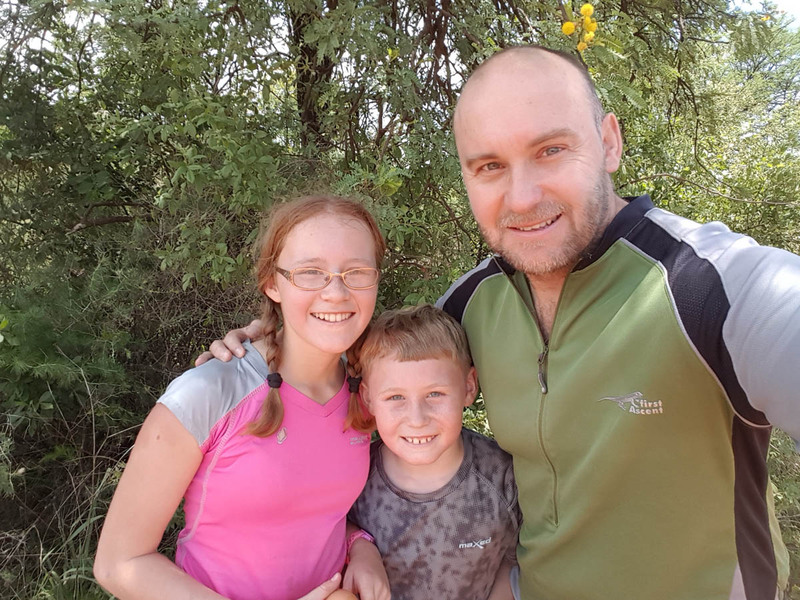 Apart from this, I would say my Top 3 experiences would be the first descent of the Tsitsa Gorge in the Transkei (took us five days), a two-week trip to Sumatra, Indonesia, where we bagged a couple of first descents, and a number of multi-day trips on the Orange River with my children. Aside from paddling, what other sports do you enjoy? I mountain bike regularly. I also enjoy adventure motorbiking and snowboarding whenever I get the chance. I’m a mechanical engineer by profession and I have spent most of the past 16 years designing and manufacturing kayaks. Where do you most often paddle? My home river is the Vaal at Parys. I train (flatwater) at the Likkewaan Canoe Club, upstream of town and paddle the rapids below town whenever the river is at a good water level. What type of paddling do you enjoy most? On a kayak trip, what item will you never leave home without? My meds for diabetes, asthma and allergies. My body is testament to the wonders of medical science. Autumn. It is not too hot, not too cold, and rivers are likely to have water in them. What is your dream paddling destination? Futaleufu in Patagonia. I made it to the Futa two-years ago when I travelled around Chile with Lisa but it was middle of winter, so I need to go back to actually paddle it. What is your favourite boat from the Vagabond line-up? As the designer of the Vagabond boats it is hard to choose; every design is special to me. 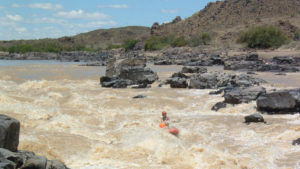 But if I may narrow it down to three instead of one, I would say the Vubu for whitewater trips, the Kasai for Orange River multi-day trips, and the Mokolo for being a game changer in the flatwater recreational and fishing markets. What most excites you about being part of Vagabond? In Vagabond I am able to give my creativity free range in creating kayaks that anyone can enjoy paddling, and being able to build a new business and brand with like-minded friends. Of all the places you have travelled to, which stands out the most? China. It is where I learned that humans really are all the same, no matter how different our cultures. What is the most useful thing that you own? Boring as it sounds, I have to say my laptop. What or who had the biggest impact on the person that you have become? What: Paddling. Most of my adult life has revolved around paddling in some way or another. Who: My children. They changed my perspective of life. What is the most memorable/impactful book that you have read to date? ‘Zen and the Art of Motorcycle Maintenance’ by Robert M. Pirsig. If you could sit down with your 16-year old self, what would you tell him? My 16-year old self didn’t take advice from anyone, so this is a moot point. I was introduced to paddling through Sea Scouts when I was 13. My first events were downriver races in a K1 on the Klip River. I did the three-day Duzi Canoe Marathon for the first time at the age of 16 and just kept paddling. K1 and K2 in marathon and river events, various whitewater kayaks, canoe polo, six-person rafts, surfskis. I have been on teams for regional and national canoe polo championships. I first paddled the Duzi Canoe Marathon at 16 year old; and again at 17. I have completed multiple Fish River Canoe Marathons as well as Duzi, Breede and Vaal marathons. I have had the pleasure of kayaking the Zambezi River, White Nile and multiple rivers in South Africa’s KwaZulu-Natal, Free State and Mpumalanga provinces. 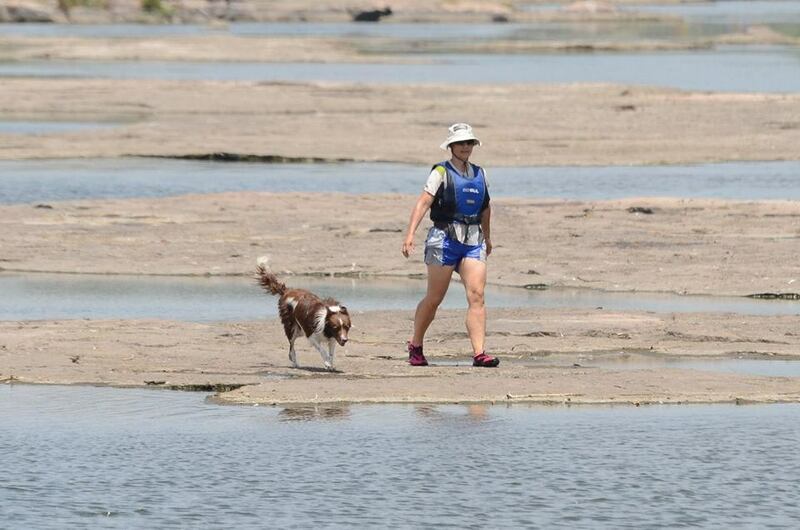 Paddling the Vaal River on the section at Parys when the water was at +2,000 c/sec, a multi-day trip on the Zambezi, shooting Montross and Thrombi Falls, and paddling river marathons in a mixed doubles K2 with Nicola, my wife. 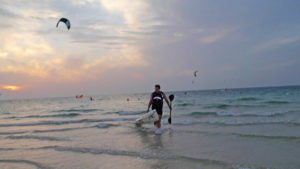 An evening paddle in Dubai. Mountain biking for leisure, road biking, road and trail running (Paris Marathon, Myanmar Trail Marathon, Wadi Bhi Relay) and snow ski (I’m a late starter, but love it). I have been in construction for most of my career. I took some time out for a stint in tourism in Victoria Falls, Zimbabwe and I took a year off to travel around the world. I’m now working independently. Emmarentia Dam in Johannesburg and any river with a bit of whitewater in K1, K2, touring or whitewater kayaks. 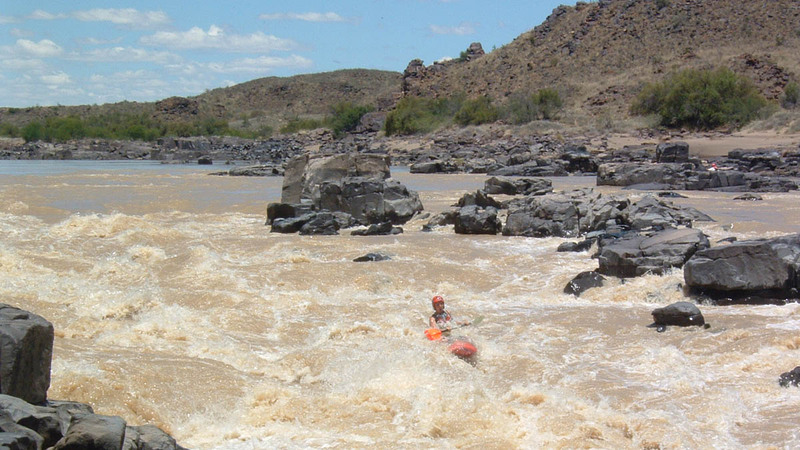 James at Long Drop on the Orange River. River paddling, preferably multi-day trips. My family (Nicola and Ethan) and our Land Rover Defender! Year round and being outside. The Dumbi. The ocean takes me out of my comfort zone so it is fantastic to have a boat that makes ocean waves so accessible. That we are producing boats that are accessible to everyone. Vagabond’s kayaks are great to paddle and they make the outdoors and waterways open to everyone who wants to give paddling a go. A loop in the USA going through the Grand Canyon, Bryce Canyon, Las Vegas, Death Valley National Park, Zion National Park, Yosemite National Park, San Francisco and the South Fork of the American River. Husband, father, quietly competitive, outdoors. Who has had the biggest impact on the person that you have become? Nicola, my wife. She gave me the ability to connect. What is the most memorable or impactful book that you have read? ‘Kayak – The New Frontier’ by William Nealy. Nealy makes the art of paddling simple and accessible. I only began paddling when I started adventure racing in 1999. Paddling is one of the sport’s three core disciplines. Paddling two-person inflatable rafts provided by races didn’t entice me to take up paddling but led to an invitation to join the SA women’s team for the 2001 Camel White Water Challenge on the Zambezi River. Here I learned valuable lessons about rivers and reading water, which carried me through paddling a variety of boats in adventure races on rivers, dams and irrigation canals! It was only when I began to prepare for the 2008 Abu Dhabi Adventure Challenge that I really started focusing on paddling, seeing a coach to improve my style and technique (I went to ADAC in 2008, 2009 and 2010). Moving to Parys in 2016 has been a bonus for my paddling with the Vaal River on my doorstep. I’m now developing my whitewater skills. Two-person inflatable raft, six-person raft, double sit-on-top, K2, K1, touring kayak, surfski, whitewater creeker. 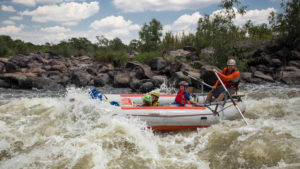 Rafting the upper rapids of the Zambezi River at high water was an eye-opener! 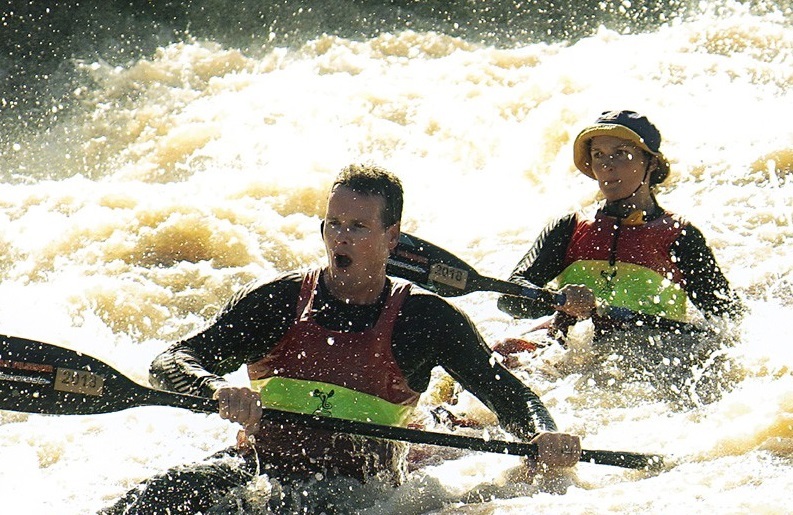 Paddling irrigation canals at the Swazi Xtreme Adventure Race was an experience! A fast, swim-free river run at Wartrail and Swazi were satisfying. 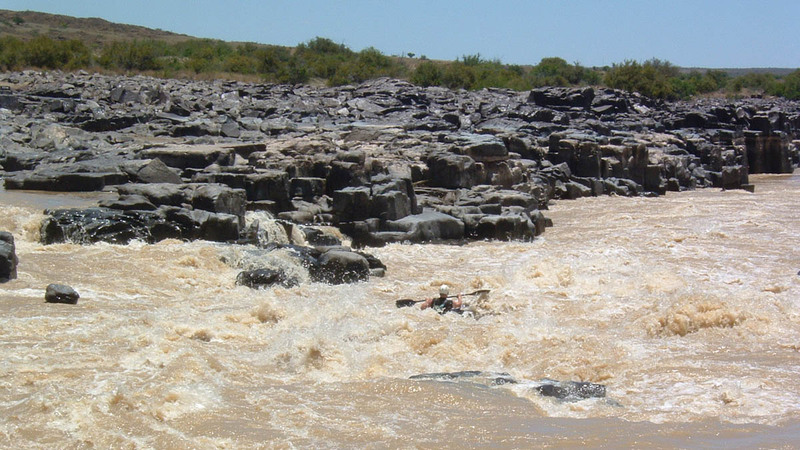 The Tugela River near Eshowe in a two-man raft with one paddle between us, in the dark, at high and rising water, was scary. Paddling a river in KwaZulu-Natal under moonlight, with steep banks on either side and a teammate with diarrhoea was very funny and unforgettable. Running has always been my first love – any terrain, any conditions, any distance, anywhere. Adventure racing was my life and obsession for 15 years. Orienteering combines my love for navigation with ultra-distance running; my favourite orienteering discipline being rogaining events of 6-24 hours. I paddle regularly but mountain bike less often. Ashtanga yoga is my favourite yoga type, which I practice too seldom, and I’ve benefited over the years from a variety of disciplines including underwater hockey, aerial circus school, pole dance and step aerobics. Jack of all trades indeed! I’ve primarily been freelancing in media, PR, writing, website editing and event organising for the past 18 years. I started a new company in 2017; we make the YOLO Compost Tumbler in our Vagabond factory. Lisa gaining whitewater experience on the Vaal River. Flatwater on the Vaal River from our local Likkewaan Canoe Club and the section of the Vaal River in Parys with its rapids and islands. I like the metronome-like rhythm of flatwater, using paddling to get from one place to another and paddling downriver. All of them – for the changing scents and vegetation and the visible passage of time (but I do prefer sun to cold!). I have family in the Seychelles and it is a long time since I visited. I would like to paddle a Marimba from Mahe (where my uncle lives) to Praslin (44km) to La Digue (11km), where a cousin lives, and back to Mahe. I don’t have a very good stomach for the sea but with a calm day and a dose of Valoid, I’ll be good for it. I would definitely love to paddle some of Los Sieta Lagos in Chile too. The Marimba – for its speed and that there is space for my dog, Rusty. Vagabond feels like a culmination of everything I have done before. It gathers up my skills and interests and experiences and allows me to direct these into the single biggest ‘project’ of my life. 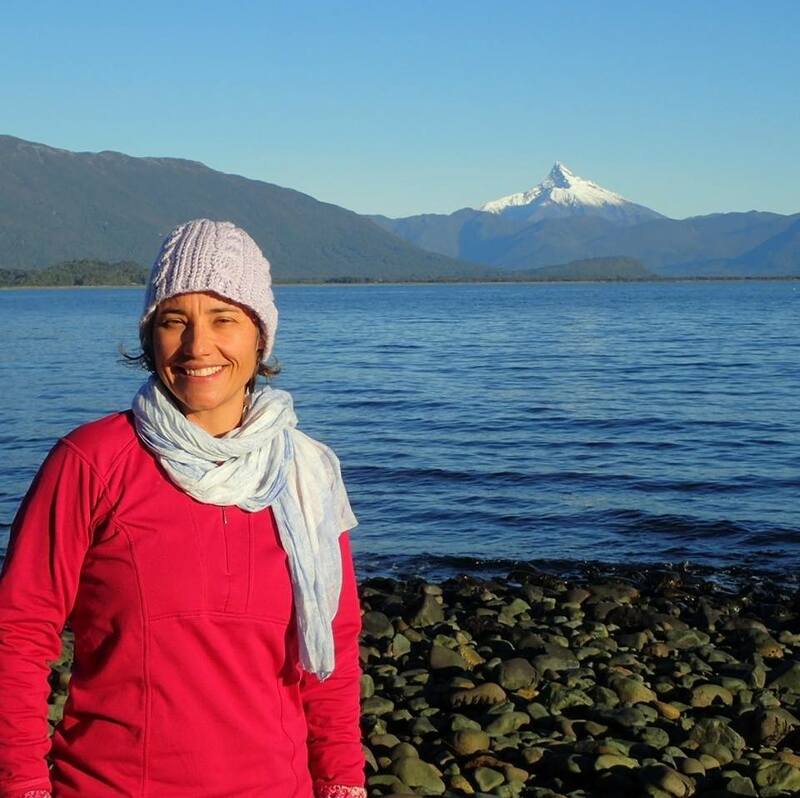 Chile, especially the Los Siete Lagos areas and Patagonia. I love the mountains, volcanoes, forests, lakes and rivers; the people, culture and language; and the wide open spaces, estancias and small towns. 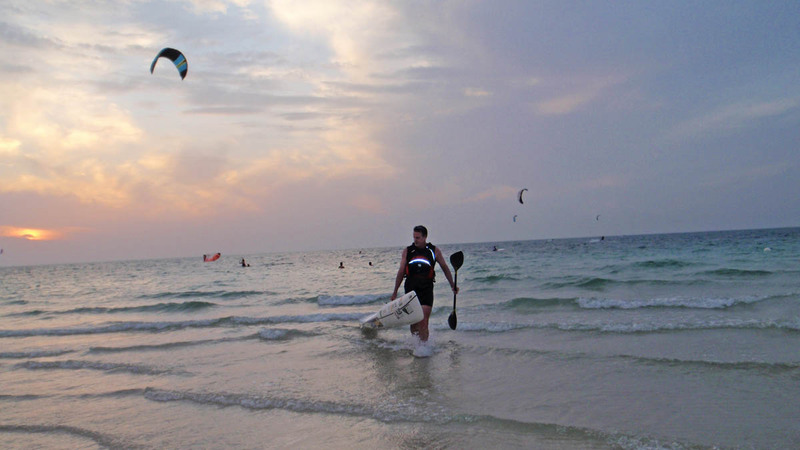 Two legs (80km + 40km) of sea kayaking at the 2008 Abu Dhabi Adventure Challenge. Passionate about people, places, adventures and running; and a compulsive organiser. My AR Adventure Gaiters, which I designed and my mom manufactures. I can run with confidence through any vegetation without getting my legs shredded. My mom, for giving me the freedom to follow my heart and to chase my dreams. Many other people along the way have shaped my life. There was the friend at high school who invited me to join him and his dad at road races. Friend(s) and editors got me into writing for media about adventure racing and trail running. A TV producer who gave me a shot at being a camerawoman and offered me a job. And then there were many who backed me when I created projects like my FEAT adventure talks event. I could have gained none of the experiences that I’ve had without their belief in me. ‘Gone with the Wind’ by Margaret Mitchell is one of the few books that I have read multiple times. It is a story of courage, determination and tough times. ‘Green Eggs and Ham’ by Dr Seuss is a gem (just try the eggs, dammit!). Alfred Lansing’s book ‘Endurance’ about Shackleton’s 1915 Antarctic saga started me on real-life adventure books (and probably lead to me creating FEAT). I have a much-loved library of adventure / polar / mountaineering books. More than 20 years ago I read Irving Stone’s book, ‘Lust for Life’, a biographical novel about the life of Vincent van Gogh. A line early on in the book made an impact and has always been in my head and heart. If you could sit down with your 16-year old self, what would you tell her? You always know what you want to do; follow your heart and just do it without hesitation. You’ll never regret it. I got interested in the Berg River Canoe Marathon and paddling K1s while I was doing my internship at Tygerberg Hospital. A few of us doctors went up to Paarl to watch the start of the Berg River that winter. I was fascinated by this sport immediately. I went to the army the following year, in 1988, to do compulsory military service in Potchefstroom. I had to choose a sport. I still wanted to paddle and do the Berg River Canoe Marathon but I’d never had the money to buy a K1. 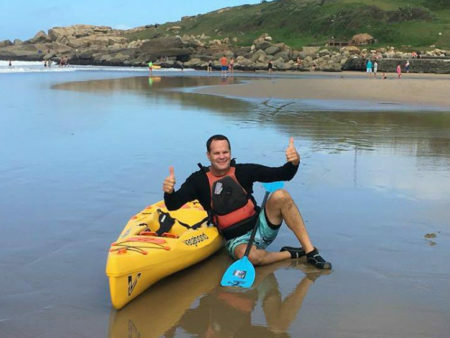 As I’d never paddled before, they wouldn’t give me a pass out for paddling, so I got a running pass and we’d run from the base to the Potch dam, paddle and run back. After the first few months of basic training, I got my first paycheck and bought my first K1. After a year of paddling, I qualified for the Berg and I was hooked. I’ve paddled K1, surfskis on the open ocean and a lot of different whitewater kayaks. I’ve paddled the 230km Berg River Canoe Marathon 16 times, of which 15 were consecutive. I’ve done flatwater paddling as part of canoe triathlons, including Ironman (21km paddle, 101km cycle, 42km run). I achieved provincial colours for triathlon for Western Transvaal (now North-West Province) and participated in the South African Championships where I finished 21st overall. My last Berg River Canoe Marathon stands out by far. It was in 2011, about a year-and-a-half after donating one kidney to my sister. It had taken time to recover and for the other kidney to regain full function. I didn’t have enough time to train so I went into the race with two or three paddling sessions as training. I managed to complete the event despite numerous swims, extreme cold exposure and dehydration. As I reached the last buoy and turned, I could see the finishing line in the distance. There was a group of spectators who has a speaker system on the banks and they played the theme music from Chariots of Fire. This brought tears to my eyes and the experience still stands out to this day. Another notable achievement was finishing 57th overall on the Berg River in 1995, despite having a knee injury and being unable to portage. I have a deep passion for paragliding, which is my main sport at the moment. I do free-flying, mostly down in the Knysna-Sedgefield-Wilderness area of the Western Cape and also in Annecy, France. My longest flight using thermals has been two hours fifteen minutes. I recently started doing powered paragliding, which uses a paramotor to fly. 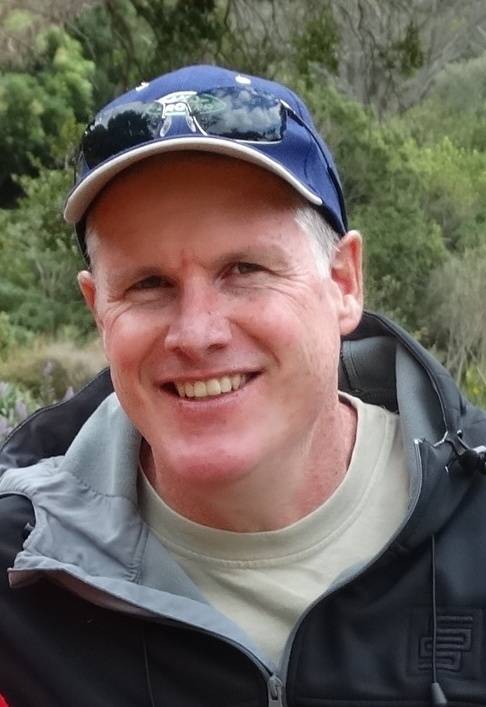 I love motorbike riding and often go on solo, offroad bike trips into Lesotho or around South Africa. I qualified as a medical practitioner from Pretoria University in 1986 and went into general practice at various government institutions all over the country. I went back to Pretoria University to specialise in orthopaedic surgery in 2000 and I qualified as a specialist orthopaedic surgeon in 2007, with a special interest in spinal surgery. I have my own practice in Margate. 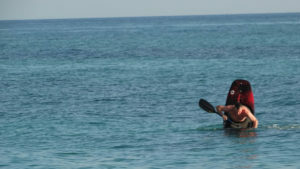 I do most of my paddling in the ocean – wave riding using a surf kayak. I also do some flatwater paddling on the Southbroom lagoon. I have a passion for flatwater paddling. Although some people find it quite boring, I do quite like it. I also enjoy moderate-to-mild rapids and overnight kayak trips where we sleep on the river bank. I’ve run through a quick checklist of items that I normally take along. High priority would be my thermal vests (I usually take two so that I always have one dry and for cold evenings), my thermal sleeping bag and my tent. With these three items, I feel I can make do to sleep on an overnight trip, even if I don’t have food. If you are warm and comfortable you will be able to survive. I am an outdoor person and I absolutely adore spring and summer. It fits my paddling training to be ready in winter for Berg. Flying is also done best in the summer season when there are more active thermals and less rain in the Western Cape. What have been your favourite paddling destinations? 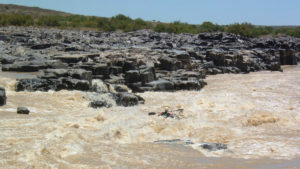 The Berg River in the Western Cape and the rapids of the Zambezi with Celliers and other paddlers. For now, the Kasai. I have not yet paddled them all so I may change my answer later. I like doing new things, I like challenges and I like going where no one has gone before. I enjoy this about Vagabond. It is all new; it is exciting. Celliers has done amazing designs in the past and I was certain that he would do so again. He is doing an amazing job with Vagabond’s new lineup. Undoubtedly France and Lake Annecy, where I have travelled for paragliding. I’m a very dedicated person. Once I have decided that I want something, I will not give up easily. I’m motivated to complete anything I set my mind to do. My hands. Without them, I’d be lost. My maths teacher in Standard 8 when he told me in front of the whole classroom that I would not be able to obtain a distinction in maths in Matric. As you probably realise, I did get a distinction. The Bible. I live by it, I believe in it and would suggest it to anyone. In 1991, I rafted on the Zambezi River in Zimbabwe whilst on holiday. There I heard that an African woman had never been a river guide. I wanted to be the first so I returned to the Zambezi in 1992 and became a river guide on a 16ft inflatable oar-frame raft. I started kayaking this same river in 1995. I started out guiding an 8-person 16ft inflatable raft. My first kayak was a Perception Pirouette, which was a perfect way to start on a Grade 5 river. I have been paddling a Wavesport Stubby for a number of years. 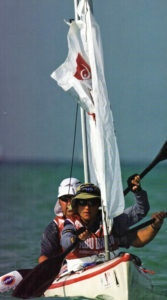 Since 1997, I have competed in K2 canoe races with my husband, James. 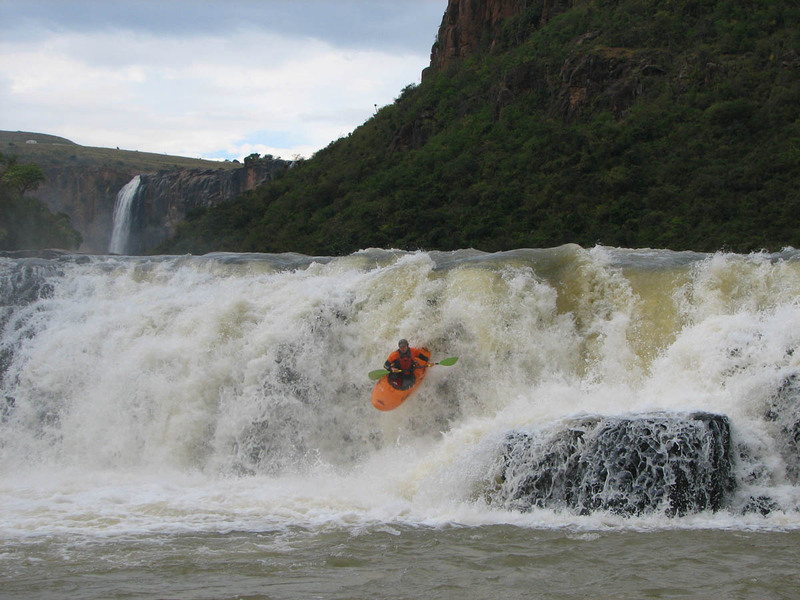 I represented both Zimbabwe and South Africa at the Rafting World Championships in 1996 and 2001 respectively. 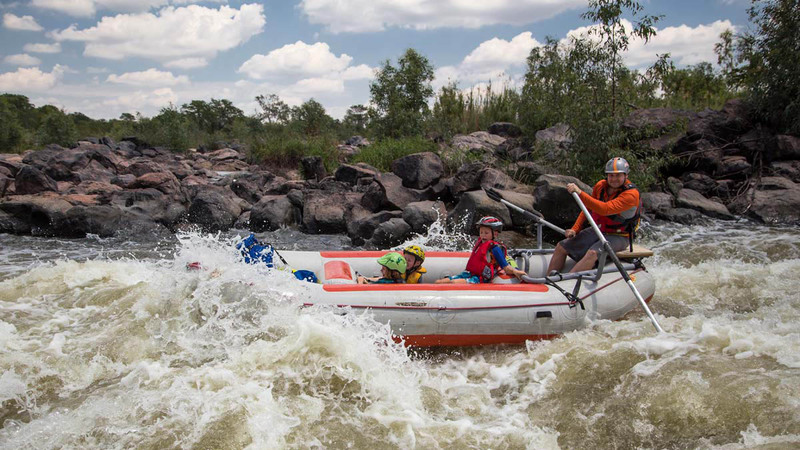 I had an epic experience on the Zambezi, in Rapid 6, which is aptly named ‘Devil’s Toilet Bowl’. I was on an oar-frame raft with six big men, and we flipped in the rapid. I landed on the upside-down boat, without getting my feet wet! Nicola in action at the Rafting World Champs. I love all outdoor sports. Running was key for a number of years; I completed marathons in different destinations (Paris, Victoria Falls, Myanmar, Dubai and Two Oceans in Cape Town). These days I also mountain bike and snow ski. I facilitate training workshops with leaders and managers off a background of adventure tourism in Zimbabwe and South Africa. I paddled the Zambezi for many years when I lived and worked in Zimbabwe. Now I most often get to paddle the Vaal River, the Orange River and the Fish River in Cradock. Kayaking and K2 canoeing on rivers with rapids. My husband, James, and my son, Ethan. James and Nicola paddling the Fish at Keith’s Flyover. Low water season on the Zambezi River. This is when there are a lot more diagonals but it is more forgiving than at high water. The Mazowe. James and I can paddle this double sit-on-top together. What most excites you about Vagabond? The culture of what Vagabond represents; it gives permission to follow dreams and gives perspective on what truly matters in life. This is key for children; to expand their global awareness, develop their creative skills and the ability to effectively handle change. It is about having the courage to set your own pace and find your own way. Paddling on the White Nile River in Uganda, where James and I spent the start of our honeymoon. Disruptive and caring, motivated and focused. Nicola at Long Drop on the Orange River. My husband, James – for his uncomplicated belief in me. He keeps me focused on what is important. ‘Beyond the River’ by Piers Cruickshank. It is about putting yourself in someone else’s shoes, never giving up, and staying focused on the destination. To live my life exactly as I have.